When startups go from a free model to a fee model, they hurt feelings. But it’s tougher for some businesses than it is for others. 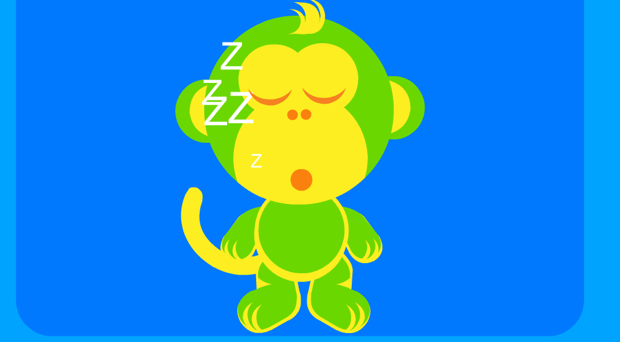 For one particular business that went to a premium model last week, the move resulted in outright temper tantrums. “Information wants to be free,” goes the mantra. The way the Internet has grown, people have become accustomed to getting services for free, and demanding that they stay that way. But as the web comes more fully of age, the providers and purveyors of that “free” information are feeling the crunch. “Nothing is free. Somewhere, somehow, someone pays for it, whether it’s sweat equity or someone’s salary,” Dommermuth tells Fast Company. “For seven years, we paid for it,” meaning that Kneebouncers ran because he and Robinson simply loved it and were willing to put in thousands of unpaid hours over the course of many years. 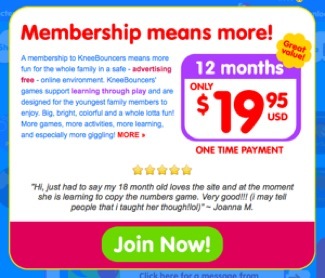 But Kneebouncers, like others, are beginning to decide it’s time for consumers to acknowledge that nothing, not even information–and a certainly not carefully-crafted games for toddlers–is free. Still, that doesn’t make matters easy. When Dommermuth and Robinson pulled the trigger on subscriptions on February 1, the reaction was instantaneous. Exhibit A: Kneebouncers’ Facebook page. 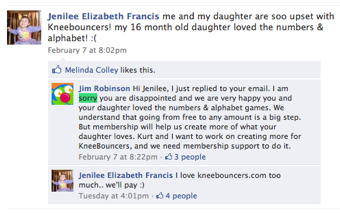 Kneebouncers is designed for toddlers, age zero through four–in other words, too young to spell, let alone sign up on Facebook. (Games are typically played with the young one on the knee, hence the name.) But because Kneebouncers regulars tend to be the sorts whose lives really revolve around their kids, many of the parents have photos of their children as their Facebook photos. Indeed, part of the lesson from Kneebouncers’ journey is that when you’re navigating a business model transition, communication is essential. The team put up a warning two weeks ahead. That only softened the blow somewhat, but the Facebook page has proven a crucial communication hub, full of examples of of irate customers who have been gently, deftly appeased. The story of how their site was founded is remarkable. The two met each other at 16, when they happened to work in the same Connecticut market, Ancona’s in Richfield. Then they happened to matriculate at the same small arts college in New Jersey, Drew University. Then they lost touch, with Robinson moving to Maryland, and Dommermuth heading to Maine. One day years later, Robinson was working on designing a site, when he downloaded a helpful web tutorial on Flash. He wanted to ask the author of the tutorial a question…and saw that the name was distinctive and familiar. The two re-connected, and Dommermuth later moved down to Maryland, where the pair now operate Kneebouncers. They built up the site to a point where it was getting 9,000 users a day in January–3,500 of those uniques. Since the paywall, they’re down to about 6,000 per day–but the uniques have held mostly steady. They are biting their nails. “We had a strong first week,” says Robinson. “It’s flattening out a bit right now. We’re keeping an eye on it daily, hourly.” The two add that they might consider a Pandora-style model, with an ad-supported free site and a paid ad-free site. But for the time being, they’d prefer to keep ads away from toddlers, and they stress that their fee only works out to five cents a day. Still, no one likes to hurt a toddler’s feelings. “We hate it,” says Dommermuth. But that’s the cost of doing business in an environment where people have been weaned on a sense of unpaid entitlement.